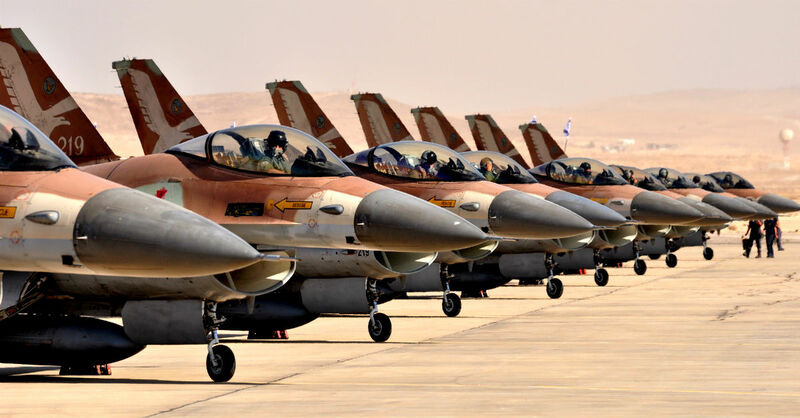 Israeli F-16s prepare to take off. On April 28, 1981 the F-16 Fighting Falcon achieved its first successful air to air combat success at the hands of the Israeli Air Force. 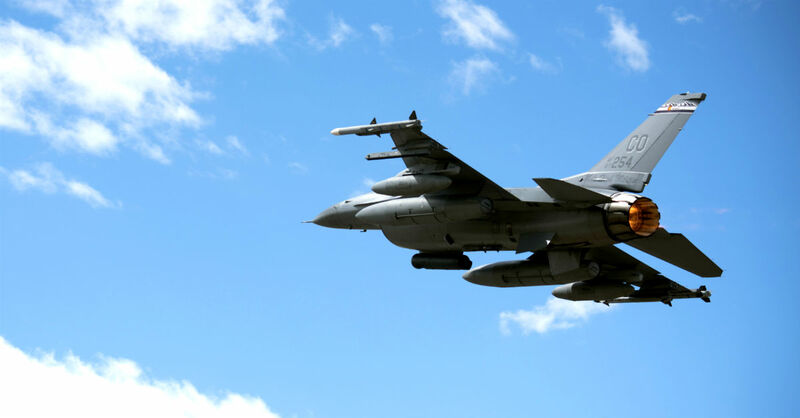 During the Bekaa Valley and Osiraq Raid, the F-16 successfully took down a Syrian Mi-8 helicopter via cannon fire. Just one year later an Israeli Air Force F-16 claimed its first “kill” of another jet fighter. An F-16 Fighting Falcon aircraft from the 120th Fighter Squadron, 140th Wing, takes off at Buckley Air Force Base, Colorado on its way to Kadena Air Base, Japan for a deployment in support of the Theater Security Package. 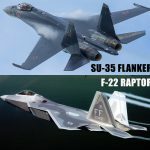 While the Lockheed Martin F-35 Joint Strike Fighter continues to struggle to become the viable replacement for the F-16 Fighting Falcon, the United States Air Force has realized its need to maintain a fleet of updated and capable aircraft. 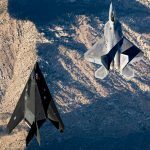 Consequently this led to a number of programs created specifically to keep this proven fighter updated with the latest avionics. One such program is the Service Life Extension Program (SLEP) effecting F-16 block 40 – 52 fleet. According to Lockheed Martin, this program will keep these aircraft operable for decades to come. Retired Air Force Col. and astronaut Buzz Aldrin, flies with the United States Air Force Thunderbirds, April 2, 2017 at Cape Canaveral, Fla. 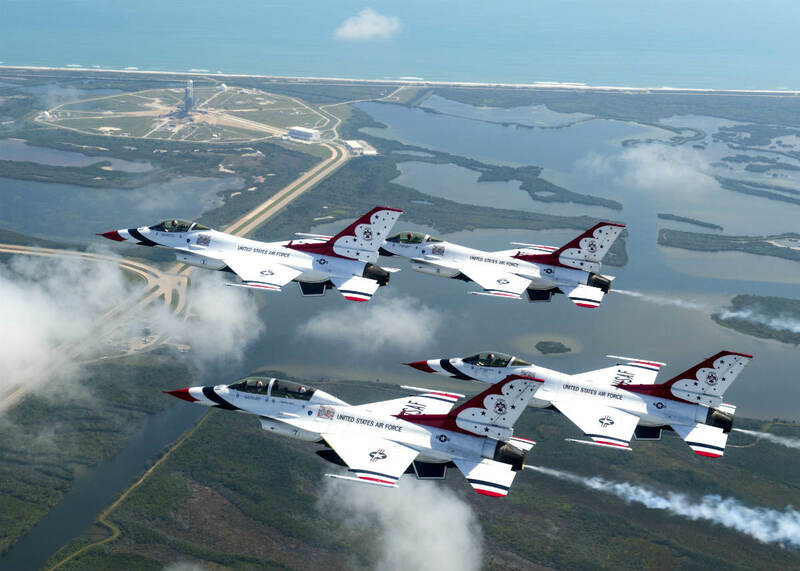 The United States Air Force Air Demonstration Squadron, better known as the Thunderbirds, have been utilizing F-16s since the early 1980s. 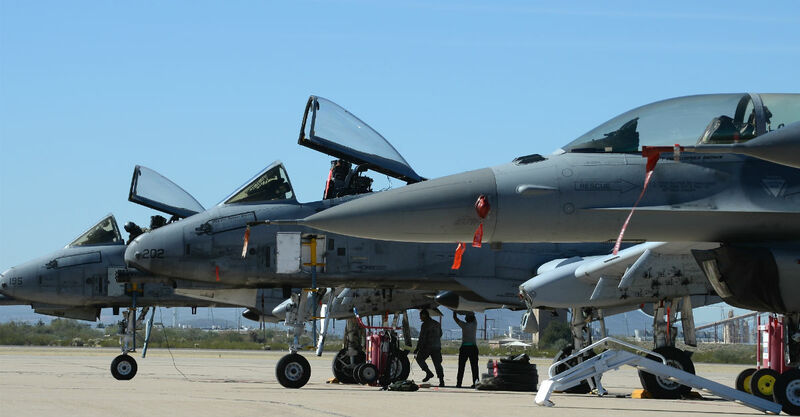 And as combat Falcons undergo upgrades on their computer systems and radars, the Thunderbirds are preparing to receive many of those same upgrades to ensure their F-16C and D variants remain show ready. The Thunderbird F-16 aircraft are typically flown harder and upwards of two times as many hours per month than their combat counterparts, so keeping them in top shape is key. F-16 Fighting Falcons from the 555th Fighter Squadron, Aviano Air Base, Italy, arrived on Bagram Airfield, Afghanistan, April 25, 2017. The F-16 Fighting Falcon is a compact, multi-role fighter aircraft, proving itself in air-to-air combat and air-to-surface attack. The F-16 has been purchased by 28 militaries with a total of 2,691 aircraft throughout the world, more than any other fighter in existence. It is also the 2nd most plentiful military aircraft in the world behind the Sikorsky UH-60 military helicopter. Two U.S. Air Force A-10C Thunderbolt IIs and an F-16 Fighting Falcon rest on the flightline during the 2017 Heritage Flight Training and Certification Course at Davis-Monthan Air Force Base, Ariz., Feb. 10, 2017. 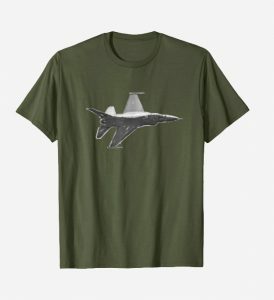 In the late 1980s, it was proposed by the United States Air Force to convert F-16s to Close Air Support aircraft in an effort to replace the A-10 Warthog aircraft. 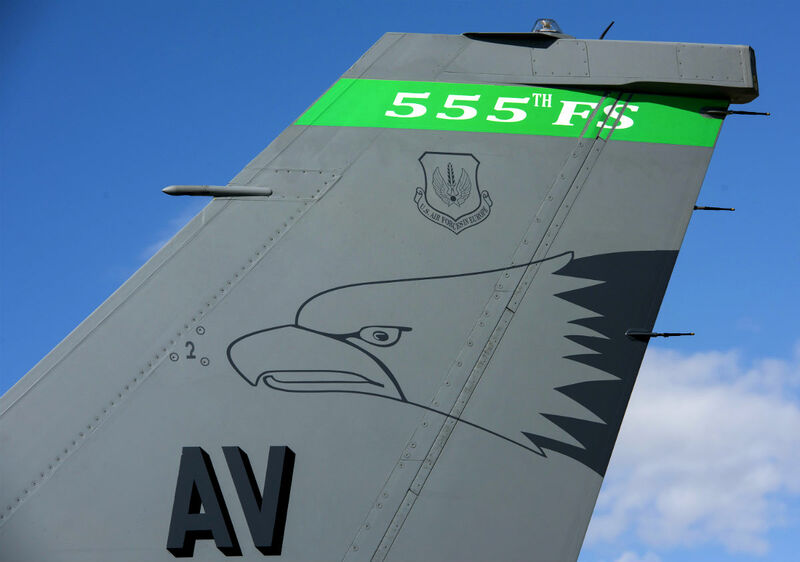 To prove that this new F-16 aircraft – to be known as the A-16 – could hold a candle to the famously tough A-10, it received a number of advanced features both in armament and avionics. 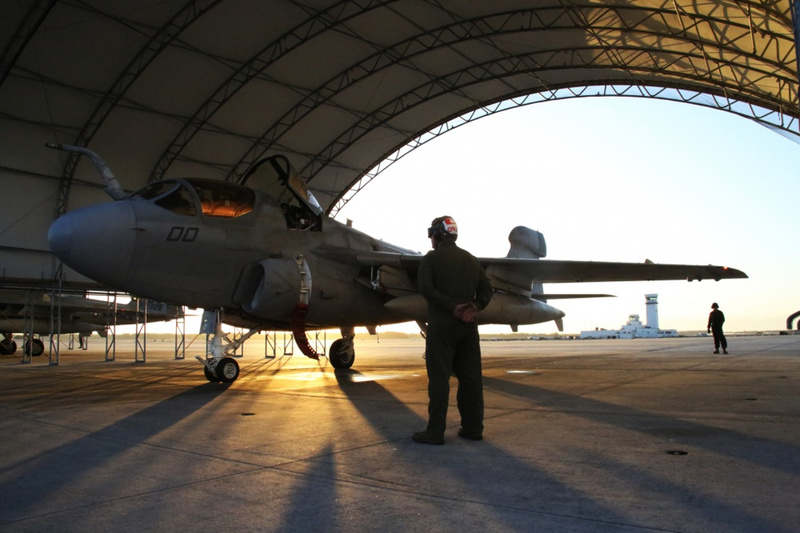 In the end, these new features weren’t reliable or tough enough to bring an end to the A-10, and the F-16 remained the lightweight jet fighter it was always meant to be. A ground crewman guides a 388th Tactical Fighter Wing F-16C Fighting Falcon aircraft onto the taxiway. The 388th TFW is deploying to Saudi Arabia to take part in Operation Desert Shield. Mounted on the aircraft's left outboard wing pylon is an AN/ALQ-131 Electronic Countermeasures (ECM) pod; mounted on the side of the engine intake is a Low Altitude Navigation, Targeting Infrared Night (LANTIRN) navigation pod. The F-16 first saw combat during the 1991 Gulf War. 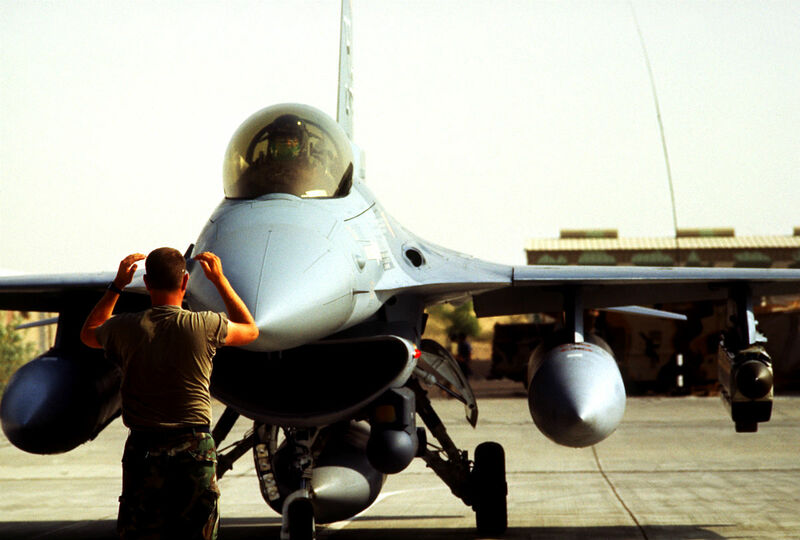 As part of Operation Desert Storm, 249 US Air Force F-16s flew 13,340 sorties to engage enemy targets. These missions were varied, but frequently involved engaging ground targets within Iraq or fighting it out with Iraqi aircraft in the skies above. Despite this intense series of missions—which often included daylight raids on protected ground targets—only three F-16s were confirmed lost to enemy action during the course of the war. This is a record unsurpassed by any other aircraft participating in Operation Desert Storm. An unmanned QF-16 Full Scale Aerial Target from the 82nd Aerial Targets Squadron is illuminated by the rising sun at Tyndall Air Force Base, Fla., Sept. 29, 2016. The QF-16 unmanned aerial targets program is operated through the 53rd Weapons Evaluation Group on Tyndall Air Force Base. Always pushing the envelope, Lockheed Martin’s Skunkworks and USAF have now developed an F-16 drone that can do more than merely act as target practice for the F-35 Program. It was announced in April of 2017 that these unmanned F-16s have proven the ability to perform air to air and air to ground strikes accurately and not only when a mission goes completely to plan. These autonomous aircraft responded correctly when interrupted by an air threat and continued on to complete its mission successfully. 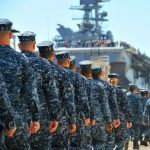 This is an exciting development for the future of unmanned warfare. Many, however, believe that no amount of technology can replace the instincts of a human pilot. 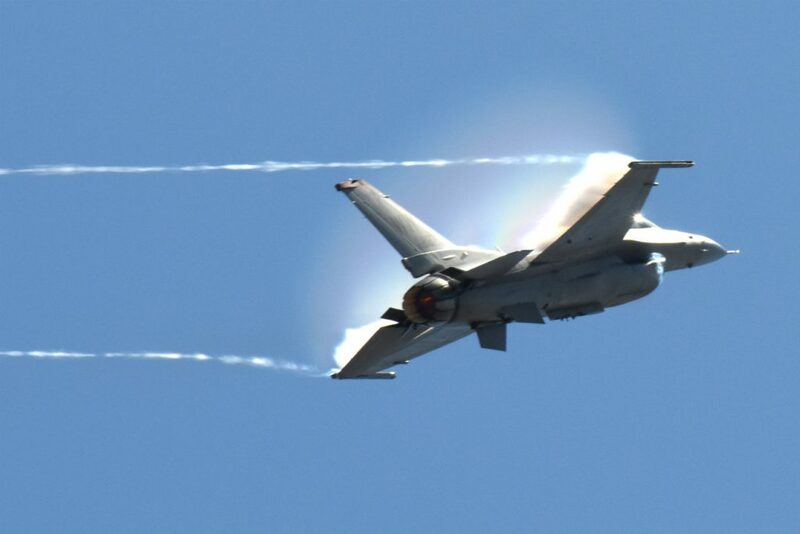 Geelong, AUSTRALIA – A U.S. Air Force F-16 Viper part of the F-16 Demonstration team from Misawa Air Base, Japan, banks straight up causing vapor contrails during the Australian International Airshow and Aerospace & Defence Exposition (AVALON) March 4. AVALON 2017 is the largest, most comprehensive event of its kind in the Southern Hemisphere, attracting aviation and aerospace professions, key defense personnel, aviation enthusiasts and the general public. The U.S. participates in AVALON 2017 and other similar events to demonstrate the U.S. commitment to regional security and stability. On the morning of Sept. 11, 2001, F-16 Falcons and their pilots at Andrews AFB were called upon to serve their country in a way no one could have imagined. 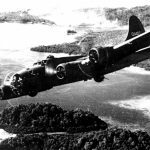 Because of the nature of the surprise attacks, the planes weren’t prepped with weaponry. In fact, they were still loaded with dummy bullets from a training mission completed days earlier. The pilots, Col. Marc Sasseville and Lt. Heather “Lucky” Penny loaded into their aircraft anyway and the mission was clear; take out airliner United 93 using all they had – their aircraft. The two had a full attack plan in place despite never having trained to take down an airliner. It was likely if the plan went through, neither would survive. Hours later, the two received word that United 93 had crashed in Pennsylvania. The two were then put in charge of escorting the President of the United States and clearing airspace. 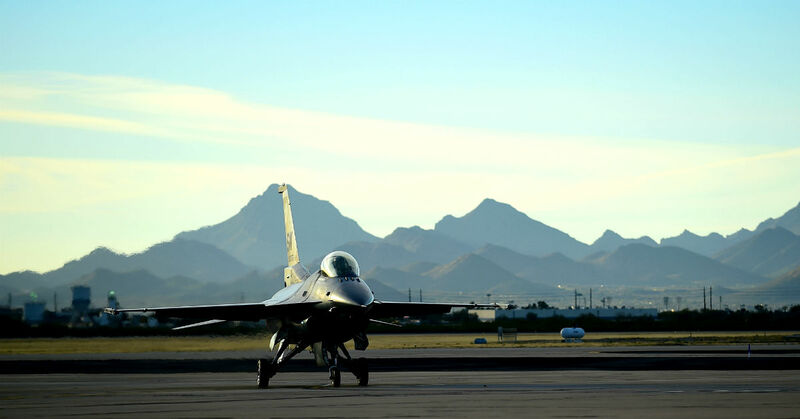 An F-16 Viper taxies after flying during the 2017 Heritage Flight Training and Certification Course at Davis-Monthan Air Force Base, Ariz., Feb. 11, 2017. 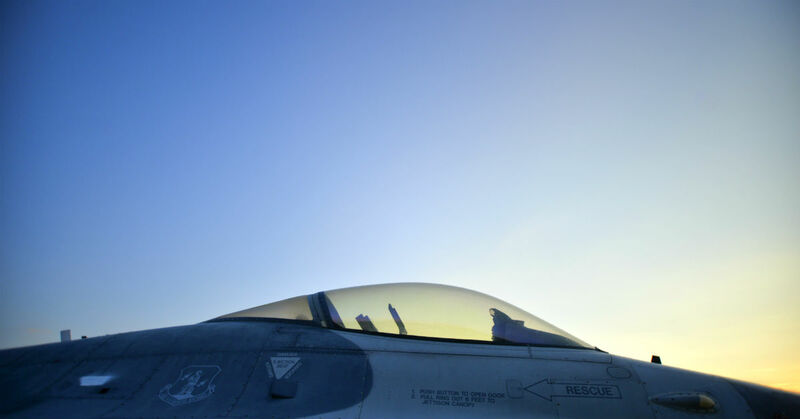 The unofficial Viper name did however stick around when it came to determining the name for the award given to outstanding F-16 pilot airmanship – the Semper Viper award.